This is a short followup. 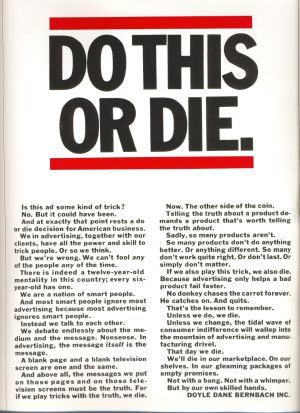 In part one I reference something Bill Bernbach wrote. An advertisement for advertising to advertising people. It is something everyone in marketing & advertising should read. And ignore at your own peril. Is this ad some kind of trick? No. But it could have been. And at exactly that point rests a do or die decision for American business. We in advertising, together with our clients, have all the power and skill to trick people. Or so we think. But we’re wrong. We can’t fool any of the people any of the time. There is indeed a twelve-year-old mentality in this country; every six-year-old has one. We are a nation of smart people. And most smart people ignore most advertising because most advertising ignores smart people. Instead we talk to each other. We debate endlessly about the medium and the message. Nonsense. In advertising, the message itself is the message. A blank page and a blank television screen are one and the same. And above all, the messages we put on those pages and on those television screens must be the truth. For if we play tricks with the truth, we die. Now. The other side of the coin. Telling the truth about a product demands a product that’s worth telling the truth about. Sadly, so many products aren’t. So many products don’t do anything better. So many don’t work quite right. Or don’t last. Or simply don’t matter. If we also play this trick, we also die. Because advertising only helps a bad product fail faster. No donkey chases the carrot forever. He catches on. And quits. That’s the lesson to remember. Unless we do, we die. Unless we change, the tidal wave of consumer indifference will wallop into the mountain of advertising and manufacturing drivel. We’ll die in our marketplace. On our shelves. In our gleaming packages of empty promises. Not with a bang. Not with a whimper. But by our own skilled hands.